I began touring schools for the “Touring Organization for Hedmark” (Turneorganisasjon for Hedmark) in 2000. 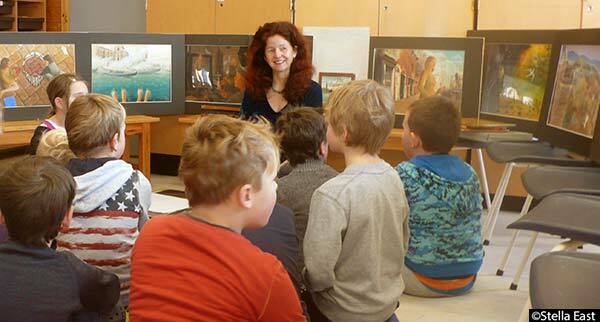 Together with producer Inga Blix, we developed a presentation/exhibition that included all the original paintings from one picturebook, the printed book, sketches, research materials and stories, for grades 1 – 7. I traveled to every school in Hedmark over a period of 9 years, exhibiting/presenting for over 12,000 children. The exhibition & presentation at Torpa School, Oppland County. Photo Mari Bakke. To play a concert in a school may hold less status than to play a concert in a concert hall. Exhibiting art for adults may also hold a higher status than exhibiting art for children. One might ask, – is a traveling exhibition of original paintings in a school in the country, as important as exhibiting in a gallery in Oslo or New York? Is a child audience attending an exhibition at a primary school, equally important as an adult audience attending an exhibition at a gallery in a city? My answer is yes. When touring schools I meet my audience, like a musician on tour after releasing a CD, or a writer after publishing a book. I paint the pictures that I loved when I was a child, and without compromise. I exhibit my original paintings where children are, – in the schools. Some of the many, many questions the children have asked over the years, and still ask today are: How did you make that black colour/transparent colour/skin colour? Are these real paintings? How did you paint the wrinkles on that face/the mist on the water/the fur? Do you paint what you see or what you think? How do you make things look real? Have you painted these paintings? Do you sometimes have to start over? How do you know how to make the right colours? What do you do if you paint outside of a line? Do you use a ruler? If you make a mistake can you erase it? How old are you? Which picture do you like the best? Do you smoke? Which picture was the most difficult? What do you paint first, the background or the picture? Do you always paint just like you planned? Do you use the smallest brushes to make stars? Have you been to art school? Discussions with children resulting from these questions inspired me to create a combined exhibition and painting workshop, – not just so that the children could experience the magic of mixing colours, but so that the programme would also be about them and what they could create and master. Some years ago The Cultural Rucksack introduced a programme where children acting as “hosts” learned how one might receive a visitor and make them feel welcome. What a valuable experience for a child, and a wonderful way for the school to get the most out of such visits. On Thursday morning I arrive at Odnes school. The beautiful Arts & Crafts room looks over an open landscape filled with frosted trees and grass. I am met by the principle and two girls. The girls help carry in the equipment and help “lay” the 22 tables. “And what else would you offer a guest?” asks the principle. Would you like some coffee or tea?” asks one of the girls. I praise Odnes school over how nice it is to be welcomed by “hosts” and how I earlier had the pleasure of such hospitality when the “host” programme was still active. “Yes, we went to those courses and have kept doing so ever since,” explained the principle. Norway has “National Tests” that “measure students’ basic skills”. “The results show the differences between municipalities, and also between schools in the same Municipality,” judged from the results of the tests that the children take. Sometimes I wish making rainbows could be the new “National Tests”. Each child creates a rainbow by listening, painting a bow, and acquires an understanding through experiencing the results of their work. 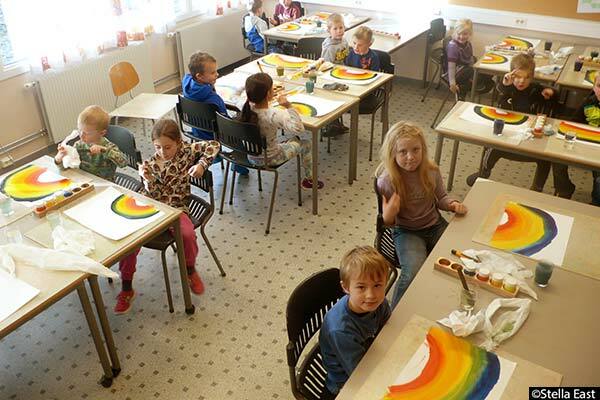 A Rainbow at Dokka School, Oppland County. Painting at Torpa School. Photo Mari Bakke. No matter how different schools may be, all children have some similarities; At a certain point, once the beautiful rainbows start to appear, someone will ask the question: “Can we take these rainbows home with us?” As the rainbows get bigger and closer to the edges of the paper, some rainbows might become more square to fit the page. 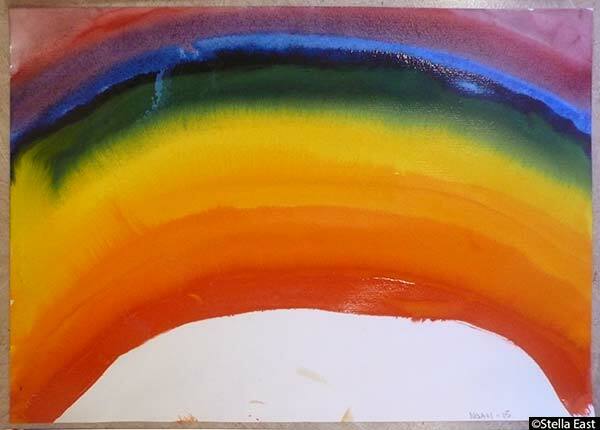 A child may then claim: “I don’t have enough room!” I tell them that they have lots of room, – its just that the photographer who photographed their rainbow was a bit too short, or stood too much to one side, and your rainbow is so big it continues outside the page. Whenever I say this, the child happily continues painting. A rainbow at Odnes School. Some children cannot paint a bow so they paint a straight line. They get a sunrise instead of a rainbow. It doesn’t really matter. The rainbow is only a form for experiencing the colours and the harmony, – which is the goal. My most underlying goal though, is that each child will experience making his or her own orange, green, and purple colours. But what if they don’t get to do it? 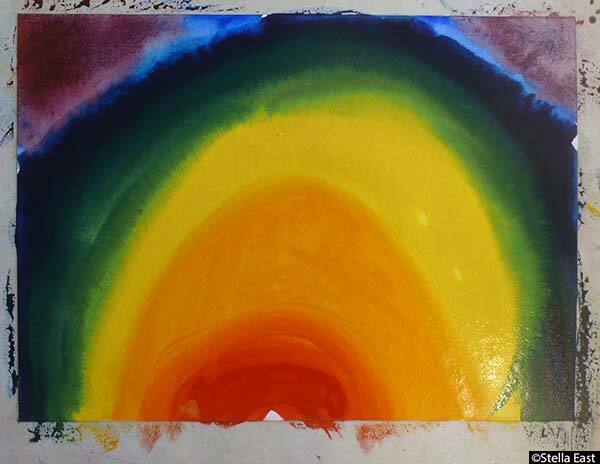 At each workshop I inform the teachers and the children, that no teacher is allowed to make the colours for the children. The children may laugh at the very idea that they are allowed to do something the teachers are not. The teachers may laugh too, though secretly knowing that they may want this experience too. 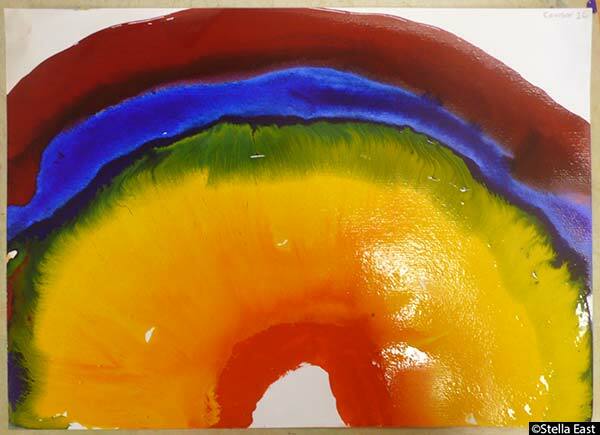 As each set of rainbows dry I put them under press made of painting-boards and books or an upside down table. 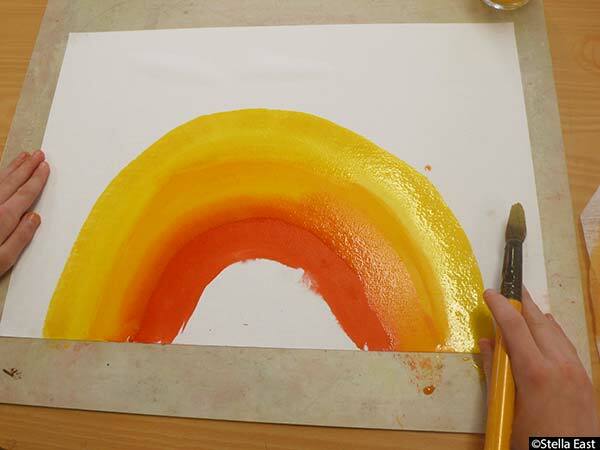 I know teachers are busy, but there is also a wish: When the teachers see how beautiful the flat, dry rainbows look, they may be inspired to press the remaining rainbows and maybe even make a rainbow exhibition after I am gone? A boy continues painting with purple even though he is actually finished. 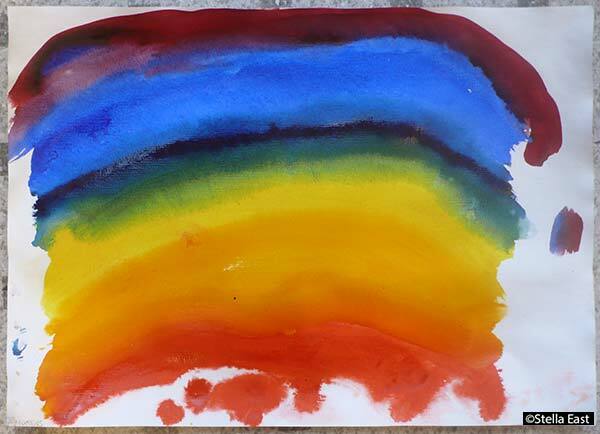 He wipes the purple all over the top-half of his once beautiful rainbow creating a blackish mud. “Oh no,” I cry out, as I see this mistake from the other side of the room. The boy though, is almost in tears. I tell him, “We can repair the rainbow with a trip to “the rainbow hospital”. No one will then be able to see that your rainbow had an accident”. The other children have finished painting. They come by and give him a hug and tell him it will be OK. I wash his brush and bring several glasses of clean water. With a clean, wet cloth I wipe away the mud. I give him the lemon yellow and he creates the first “repaired” bow. Then he makes the second bow and then the 3rd bow. The result is stunning. He sees it too. A big smile replaces his tears. Both he and his rainbow are glowing. A rainbow at Dokka School. Many of the schools I visit are quite isolated and not just by distance alone, but by fjords and mountains, ice and snow, landslides, and narrow roads. Some schools and their villages are so far from any city with a gallery, that many of these children would not have been able to seek the experience of viewing original paintings by themselves. 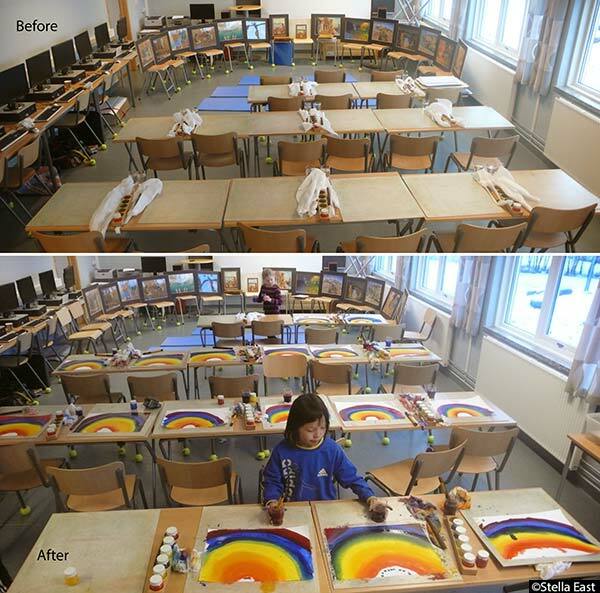 This is why I believe that this national programme for art and culture in Norwegian schools is important. This is why I exhibit, present, and paint with children in schools. Tags: Den kulturelle skolesekken, The Paint Box, The Cultural Rucksack Oppland, Oppland, and DKS.